How Do You Use Business Texting? Four decades ago, in 1977, the first emails were used by the Department of Defense to share information between people on the same network. The emails of today would be unrecognizable to those early emailers. It’s taken 40 years of innovation, creativity, and hard work, to bring us where we are: 2.5 million emails are sent every second; we send video, apps, and even money via email; and email is a requirement for virtually any business to thrive. Text messaging only turns 25 this year, but it’s gone through plenty of evolutions in use, too. Instead of tapping out messages slowly using T9 on alphanumeric keypads, we quickly craft messages with the full keyboards of our smartphones. As text messaging continues to evolve, one of the biggest areas of innovation is in business texting. The value-driven, personalized texts of today are as different from the spammy mass marketing texts as a brick Nokia is from an iPhone 7. Here is how you can use business texting as part of a cutting-edge communication strategy. The list goes on and on. When you want just a bit of info, text messaging can be the difference between weeks of phone tag or “Just circling back to this” emails and a quick answer. How often have you emailed someone to set up an appointment — a meeting to assess their interest in your services or an interview for a position in your company — and experienced delays hearing back from them? Your calendar was held in limbo until you heard back from them, perhaps causing a domino effect of scheduling difficulties. Text is great for getting your contacts on your calendar. You can eliminate the back and forth, speed scheduling, and even send along relevant info that’s tailor-made for mobile, such as a map link to your location. Part of what sets today’s business texts apart from the mass marketers of yore is that they provide the opportunity to give contacts meaningful, personalized information. Since the majority of your contacts will be reading your texts on smartphones, you can send along texts to articles, infographics, videos, podcasts, and other valuable resources that will show your audience you aim to delight. You can take advantage of the mobile environment, too. Showcase your mobile resources — from the design of your mobile website to useful apps. Nowadays, it’s not only difficult to get ahold of people on the phone, some consider it downright rude to call out of the blue. You’re much more likely to have a successful conversation with many contacts — especially prospects — by scheduling a phone call at a convenient time. You’ll likely find that, though your cold calls fall flat, text-scheduled calls are more successful and lead to better rapport. Not every message you send needs to explicitly further a sale or put a meeting on the calendar. Business text is fantastic for the kind of simple, good-hearted, just-because messages that can really grow a fledgling relationship. Fun fact: the very first text message ever sent said “Merry Christmas,” so take a cue from the medium’s history and send along holiday hellos, birthday greetings, congratulations on promotions, and other simple well-wishes. These kind words can go a long way in showing the human side of your company. Business texting isn’t just for reaching out to prospects and customers. It’s also another tool in your toolbox for building strong internal communication. Text is particularly well-suited for remote workers, teams that span multiple time zones, and employees who are frequently away from the office. Text can be used to confirm attendance at team meetings and trainings, get quick task updates, arrange office happy hours, and more. Looking for more on applications of business texting? 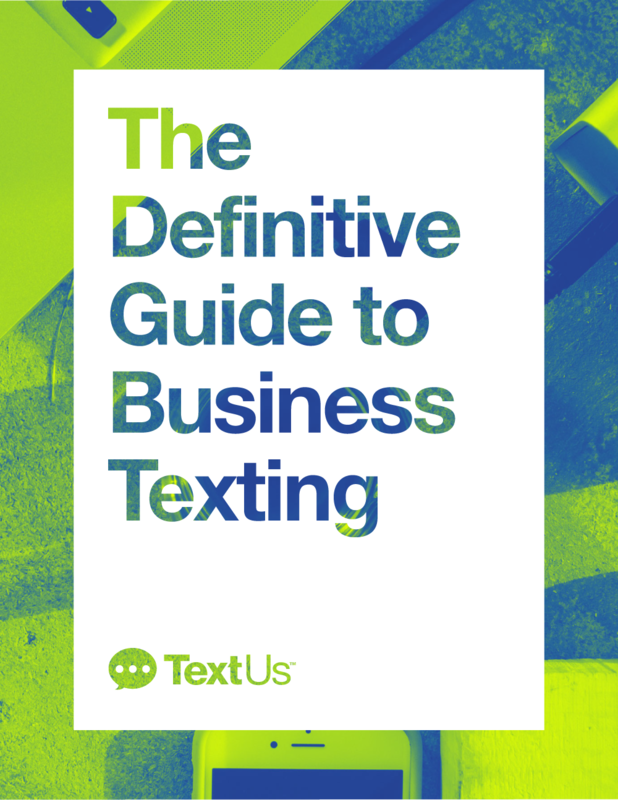 Check out our series of business texting playbooks.